Rather than broiling, my hubby decided to bake the chicken. So into a ceramic casserole dish they went. He used his handy dandy baking thermometer to let him know when the chicken breasts were halfway-done. Then he added light scoops of the pepperoni sauce mixture (his version was Chunky Mushroom Ragu sauce with chopped pepperoni added) and just a little bit of cheese. Both of these helped cut down the carbs. Back into the oven the meal went, until the thermometer said they were done. He had extra sauce and cheese on the table for the rest of the family. A side of pasta for the munchkins and steamed veggies for the entire family. It was super delicious and I didn't miss my chicken being drowned in sauce. My youngest son, who really doesn't like spaghetti sauce, preferred this recipe version. He scraped off the sauce, ate the cheese with it and said the chicken breast just had a hint of extra flavor. 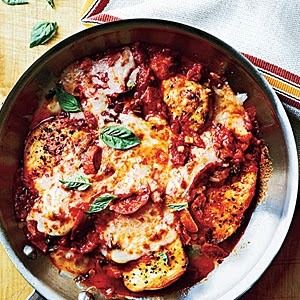 However you choose to make Chicken with Pepperoni Sauce, it will be a winner! Enjoy! Sweet Confections Cover Reveal and Giveaway!